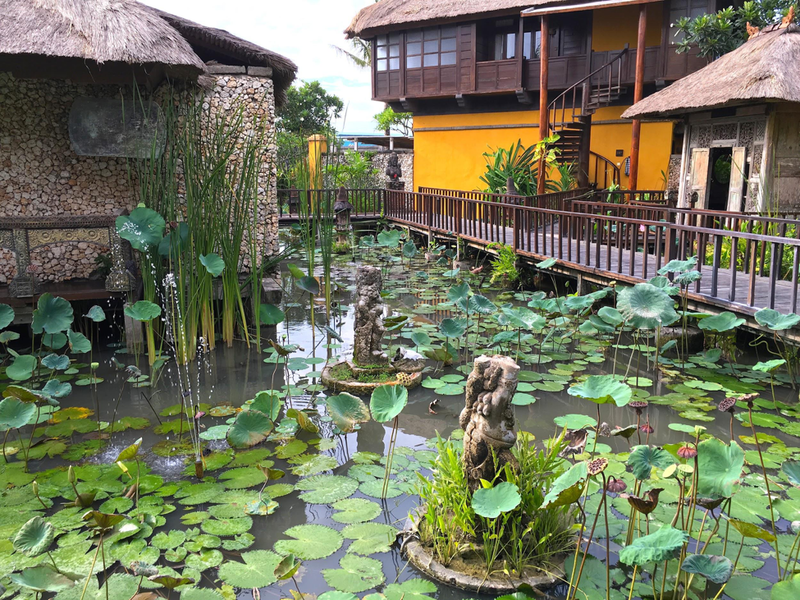 Hotel Tugu is situated right on the Bali sea in the coastal village of Canggu, about 10 miles north of the busy Kuta area, including my two stops for errands – the drive took about 30 minutes from Denpasar airport. 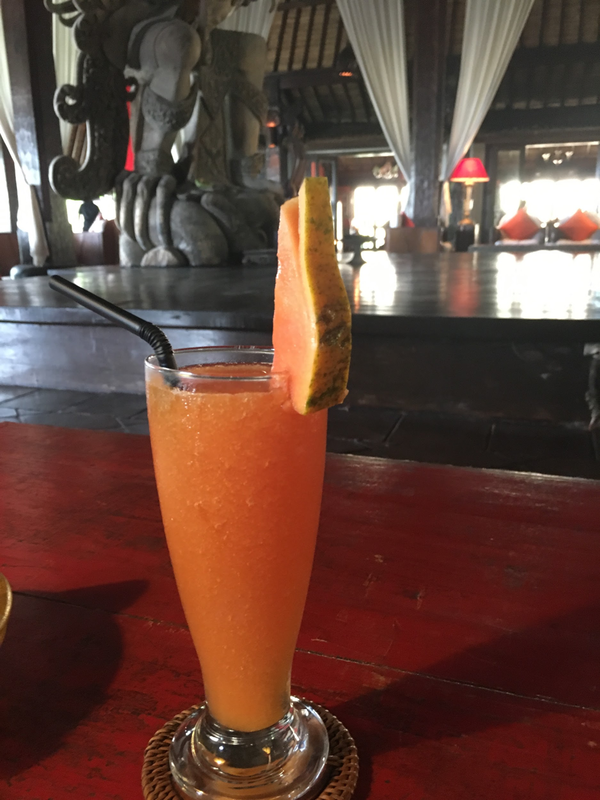 I was greeted by big smiles at Tugu and was offered a welcome drink of my choice. I opted for passion-fruit juice and enjoyed it in the hotel lobby while my check-in paperwork was handled. The outdoor, open space, entryway from the Tugu property entrance to the Bale Agung lobby. Passion fruit juice enjoyed in the lobby. 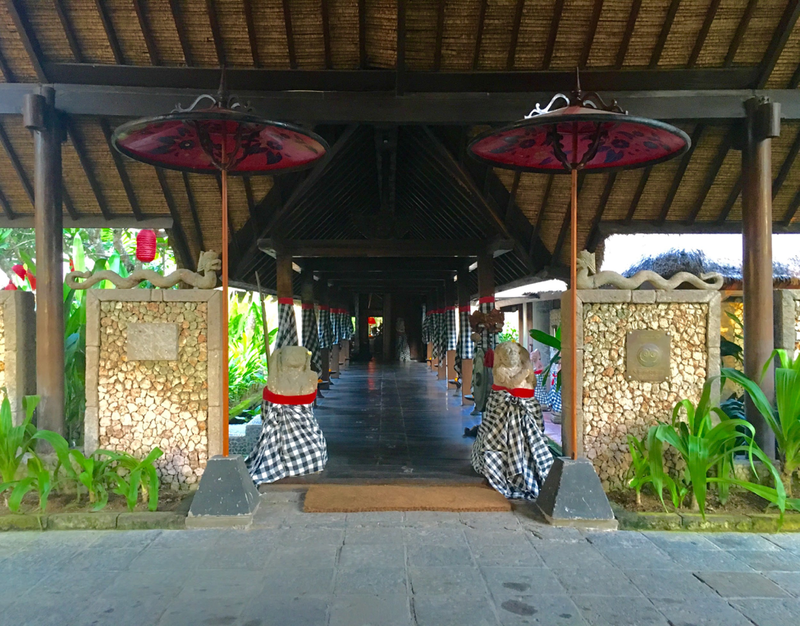 The Bale Agung Lobby, as well as the entire property, is traditional in its Balinese style construction but what makes Tugu unique as hotels go is the stories that are told all around the property. 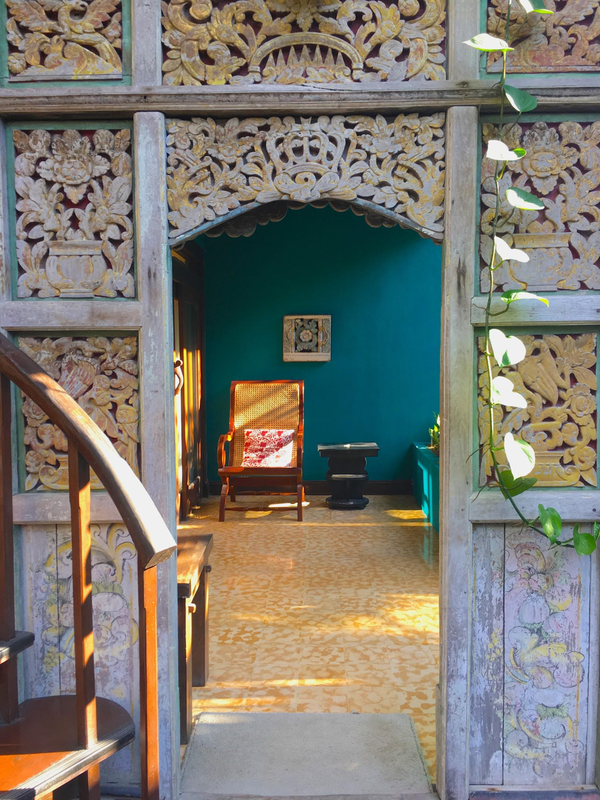 The owner of Tugu has used the property to house his vast collection of Indonesian antiques, art and furniture and it’s evident all around the property. The lobby boasts a tall wooden giant Garuda statue (tall, as in nearly 15 feet tall) carved from an entire 120 year old tree. Garuda is a mythical human-phoenix creature that is prominent in both Hindu and Buddhist religions – which explains his significance in Bali. The entire property is situated around the Bale Agung Lobby and the 21 suites and villas are dispersed around lavish gardens and lotus ponds. A lotus pond I had to casually walk past to get to my villa. But, first, let me take a selfie. 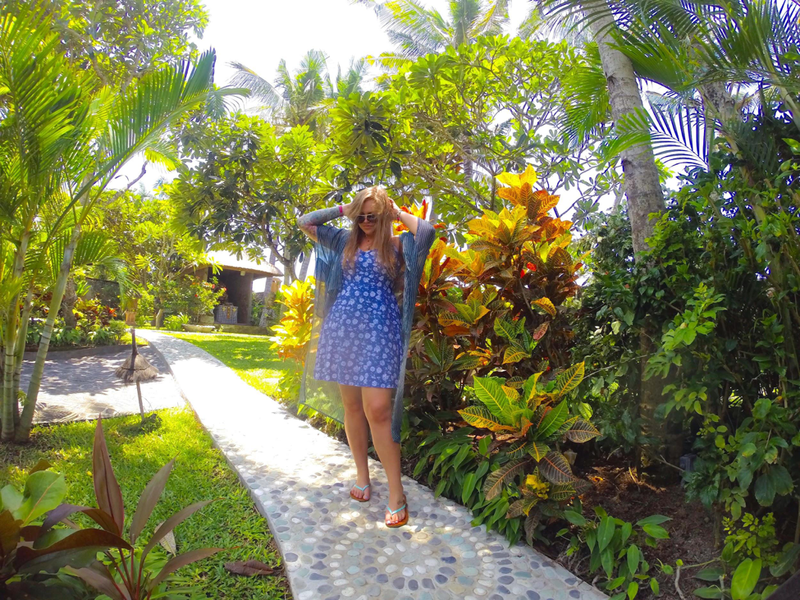 The lush gardens were a perfect place to get my selfie on. 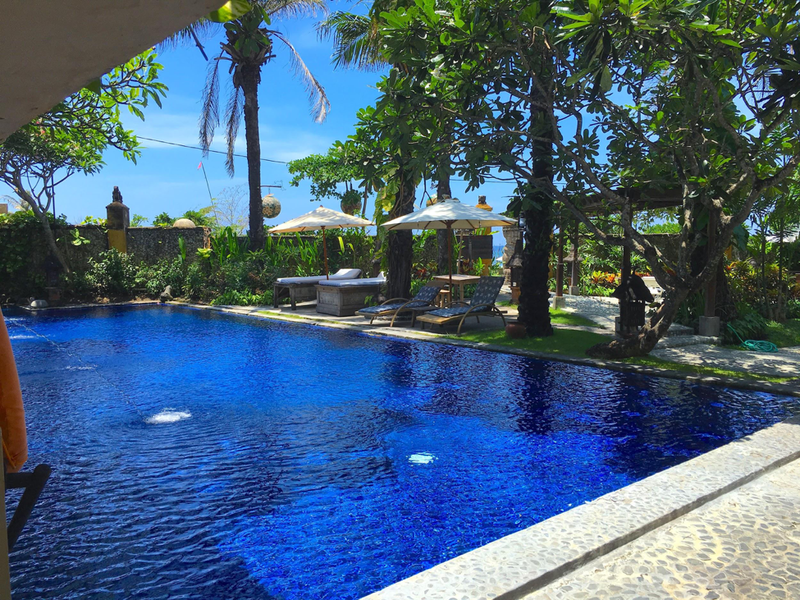 The main pool, surrounded by a lush garden itself, with the Bali Sea in the distance. 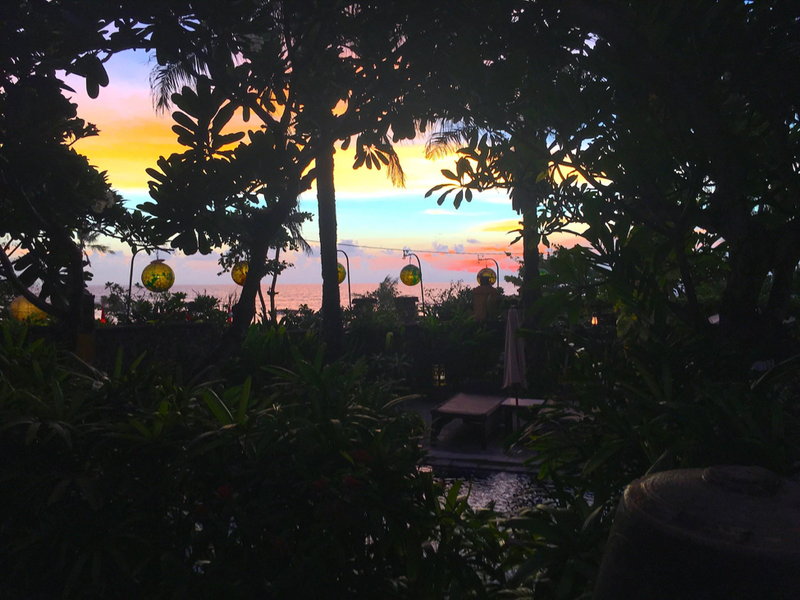 Sunset from the lobby: overlooking the pool, gardens, and Bali Sea. 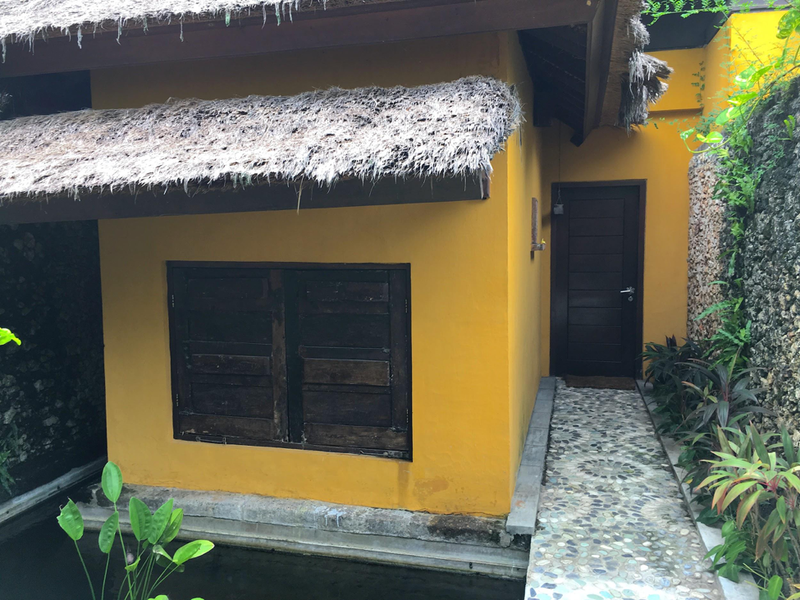 After touring the property a bit I checked into my private villa – a Dedari Suite, one of many The entryway to my villa. The villa itself was very large and furnished, in Tugu fashion, with antique Balinese furniture. There were fresh flowers and fresh fruit placed in my room daily – no shortage of luxury service or amenities. I had a small coffee station in my room and a few, complimentary, bar snacks. I love when properties don’t charge for mini-bar or snack access – that attention to customer service as opposed to business profit always stands out to me. My villa, overlooking my private pool. Not only were there fresh flowers delivered daily to my room, but they were delivered with a personalized note. I was beyond ecstatic to have my own wading pool just steps from my bed. 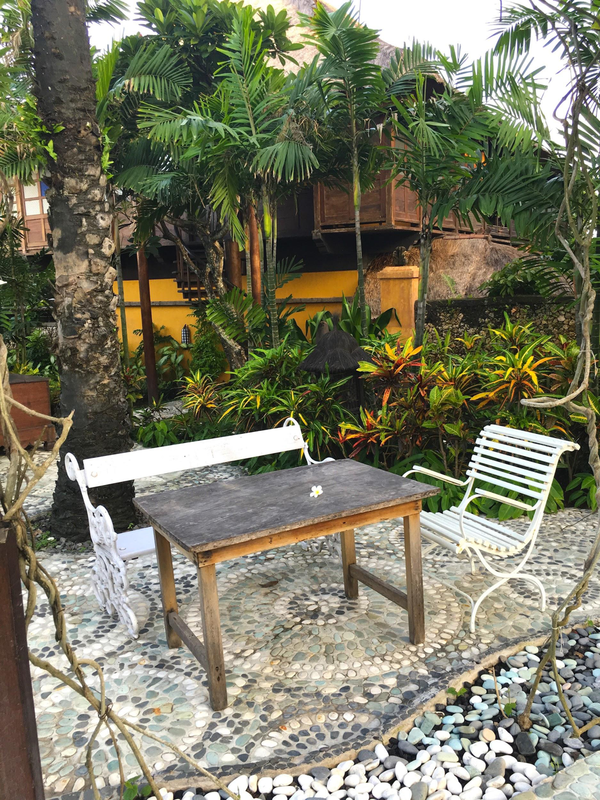 The tranquility of the outdoor space in my villa would’ve been romantic had I not been traveling alone. *insert laughing/crying emoji* But, what was equally awesome as my own pool was the open space bathroom. 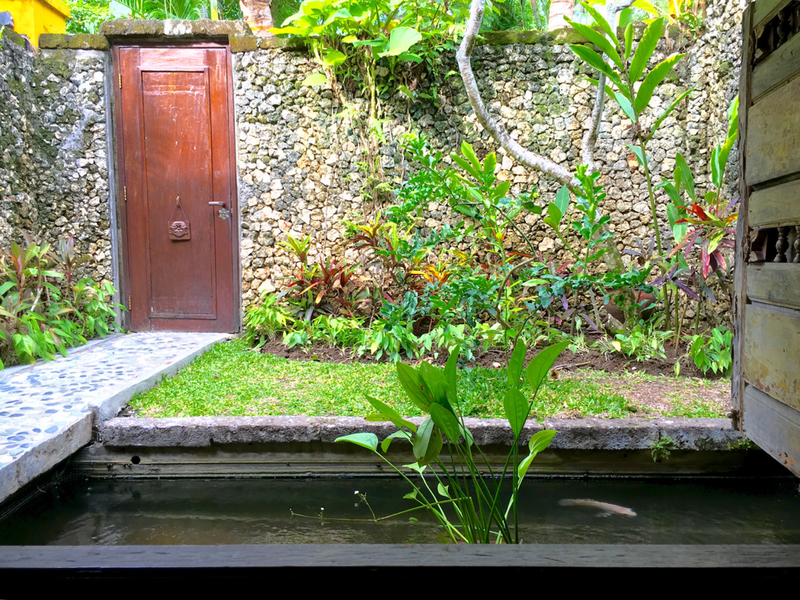 I could, quite literally, feed the koi fish in the pond surrounding the villa from my bathtub. Don’t mind me, just enjoying my own tranquil slice of paradise (on an antique Balinese swing no less) overlooking my private pool. The view from my bathtub, overlooking my villas gardens and the koi pond where I could actually feed the fish from my open air bathroom. 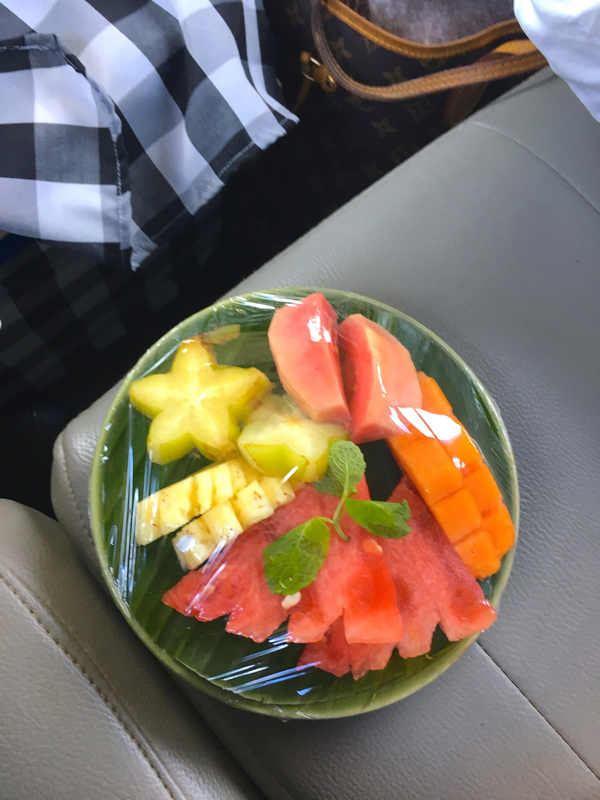 The attention to detail at Tugu was unparallelled. 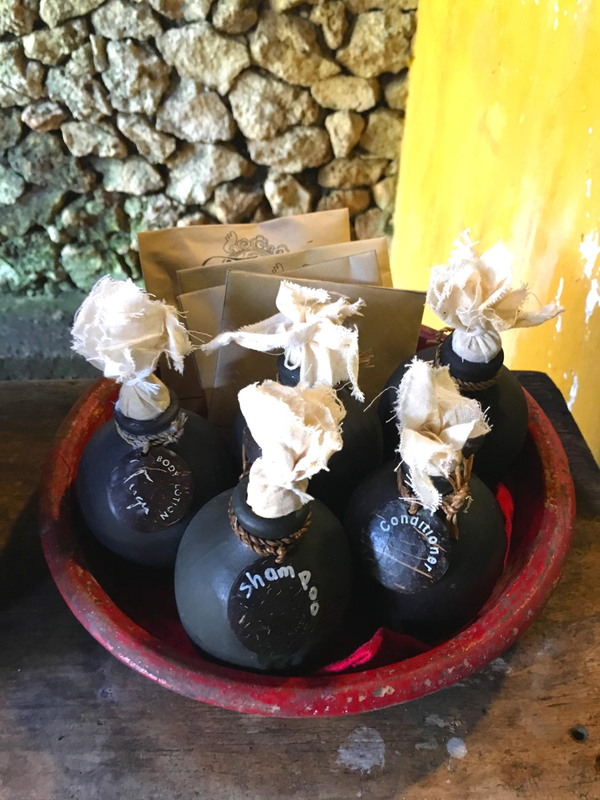 I loved the eco-friendly, Balinese inspired, display of your average hotel shampoo, conditioner, body wash and lotion and it was hardly average at all. There was even individually wrapped mosquito bite relief packets (a necessity in Bali) in the display. dining experiences, in so many Breakfast table for one, please! 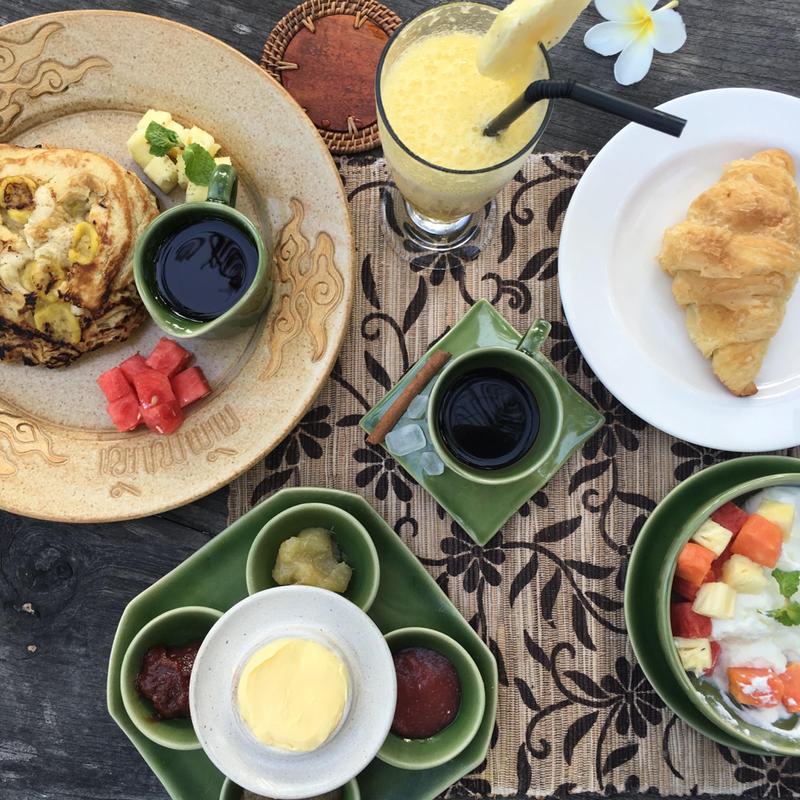 From top left, clockwise, banana pancakes, fresh squeezed pineapple juice, croissants, fresh plain yogurt topped with papaya, pineapple and watermelon, a medley of jams topped with spreadable butter and in the middle – my extremely necessary double espresso (with adorable crystal-shaped sugar and a cinnamon stick. 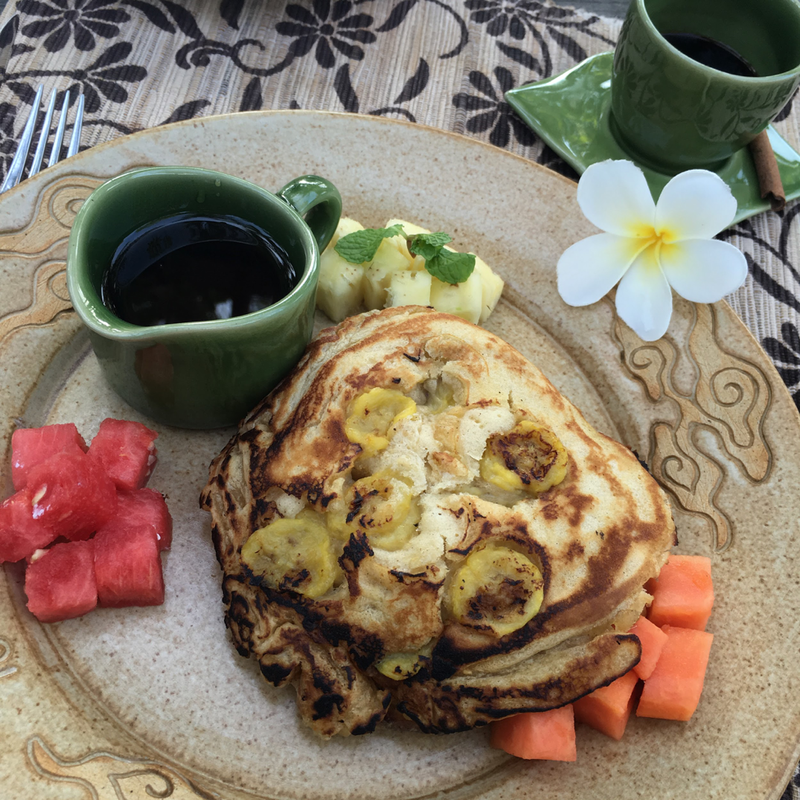 I find myself dreaming of these banana pancakes, long after my checkout from Tugu. 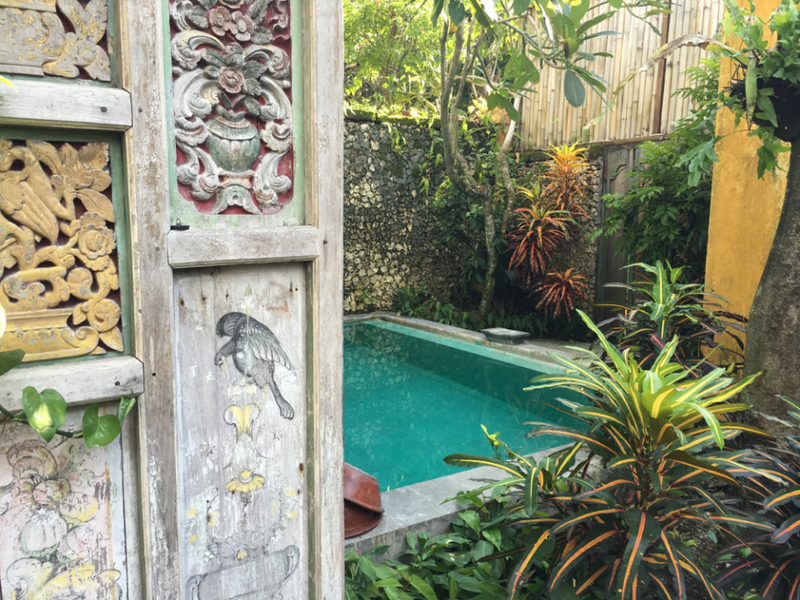 You can’t prepare to leave Hotel Tugu without a visit to Walking into the spa (equipped with its own plunging pool), through antique, traditional style Balinese doors. Another view of the spa pool from inside the Spa – surrounded by lush gardens and Tugu antiques. The entrance to my treatment room, complete with yet another gorgeous antique entryway. When I mentioned earlier that Tugu is all about stories, I truly meant it. From the stories told around the property, with each piece of artwork and furniture being an antique – to the stories that you create when staying as a guest at Tugu; there certainly is no shortage of history or mythology – and even a touch of fantasy, with the service, the property, the amenities, and the location all being dream-worthy. 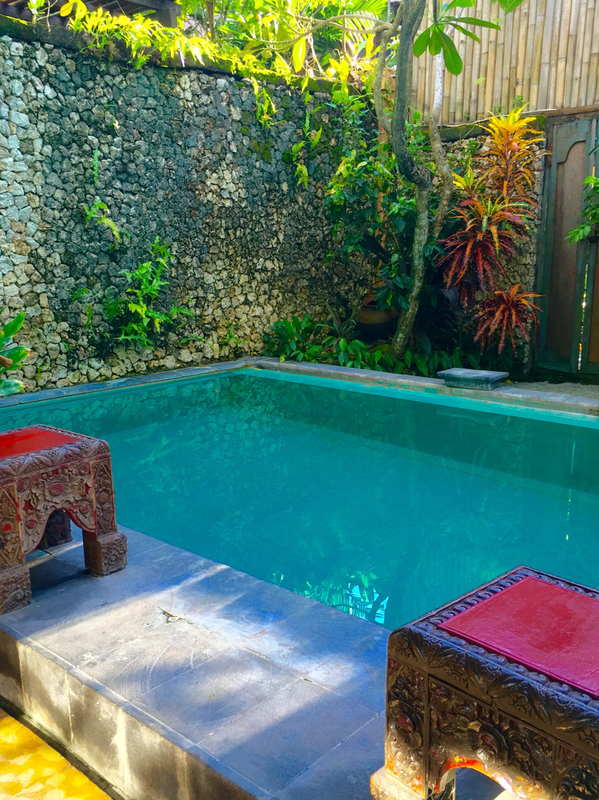 *Disclaimer: Hotel Tugu Bali hosted me as a guest at their property. My opinions remain my own. Hotel Tugu looks amazing. I love that they helped you get situated and brought fruit for the drive. It’s those little things that make a difference. And I want to jump into that deep blue pool and walk past the lotus gardens right now. The whole experience sounds amazing. Beautiful – I love how everything is embedded there in the natural surrounding. These places make you really feel like enjoying every little moment in paradise. The Spa looks amazing – so private and intimate, I can easily imagine to spend hours there. YES! Everything really is embedded into a natural surrounding. I truly felt like I was enjoying paradise (it really was paradise!!) and the spa was my favorite part – intimate and beauuuuuutiful! After the wait at customs you were more than rewarded by the Tuga hotel providing your data SIM to contact family and fresh fruit to brighten up. That’s a great selfie in the gardens, they look beautiful and relaxing. I love it when you are provided with a free mini bar, it’s very rare these days. The hotel looks very colourful, I’d love to stay here! Thanks so much for the compliments on my selfie LOL but on a serious note, a free mini bar is so rare and the customer service that I received at Tugu were AMAZING. 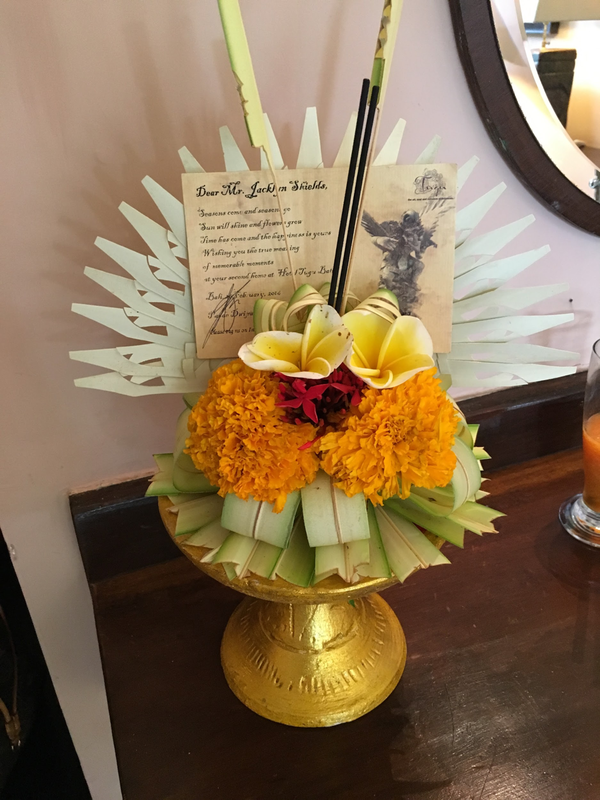 I’m jealous here…that was a VIP welcome in Bali and you are completely pampered by Hotel Tugu. What a great experience to be hosted by them. A great place to rest and relax. And the massage they offer are superb. The welcome to Tugu was out of this world! They truly know how to cater, luxuriously, to guests without sacrificing a true Bali experience. oh wow what a great article! I am living in Bali and I pass Tugu almost every day, wondering how it was to stay there – now I now. I love that they put so much effort in detail like for example the mosquito package and the cute shampoo. The food looks also amazing and I should go there for a spa day. OMG LIVING IN BALI?!?! So jealous! If you head to Tugu you should go on a Thursday – they have traditional Balinese dance/costume shows on Thursdays. I don’t even know where to begin. You had me at the personalized service they provided at airport pick-up. Everything about this hotel sounds wonderful. From the decor, layout, food, service and amenities. I hope this experience this place in person someday. I hope you get to experience Tugu also! It’s such a great property for a luxury stay, without sacrificing “authentic Bali”. Stunning! I love that this place is filled with antiques and secluded places to provide a truly relaxing holiday. The fact that you can eat whenever and wherever you would like, is really unique. I too am an early riser, and would love to get up early to enjoy the peaceful surroundings without any others interrupting the serenity. YES! I’m typically not an early riser at home but when I’m abroad I always want to be up with the sun – it was nice to be able to have breakfast before 7am, also. Hotel Tugu looks like a unique hotel compared to other big hotel chains in Bali! I love how they use antique Balinese furniture to keep the rustic feel. And how cool it is to enjoy your meal whenever and wherever you want! It’s totally unique! I love how no two rooms are the same at Tugu, and all the antiques just make the stay that much more special. Of late I’m reading so much about Bali and all your posts are tempting me to visit the incredibly beautiful place! The hotel is incredibly beautiful. Its interiors and decor are so true to the local heritage and so ecologically sound too! Thanks so much! 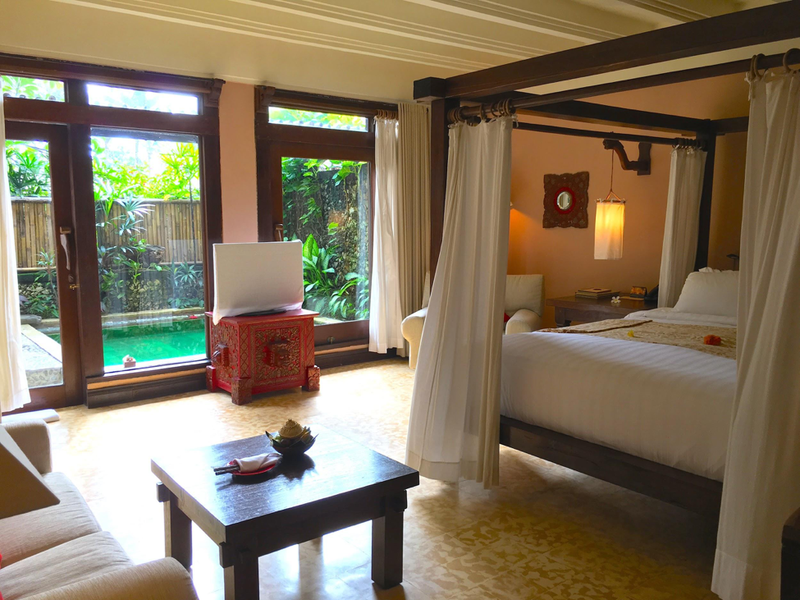 I think you’d love Tugu if you’re looking for an authentic, yet still luxurious, stay in Bali.